What height are stratocumulus mamma clouds found? The mamma clouds are structures that are attached to other cloud formations, This means they can form at any one of the low, middle or high level cloud bases. In actuality this can be more than 6,000 meters up in the sky. They are more usually attached to anvil clouds, which are indicative of a storm brewing. As you would expect at the highest cloud level, the formations contain ice mostly and they turn more to liquid the lower to earth the cloud base is. So if you find them attached to cumulonimbus clouds, which would be quite a rare sight, they would hold water droplets. Stratocumulus mamma clouds are not subdivided into other types of cloud formations and are an element in their own right. They are rare to see but are quite distinctive with the pendulous-looking structures attached to other cloud formation types. How are stratocumulus mamma clouds formed? Experts are unable to agree on the correct way the clouds are formed. Indeed, it may be due to a variety of different ways and it may depend on location too. What is clear is that there still needs to be a lot of research undertaken to increase knowledge on the subject. What do stratocumulus mamma clouds look like? The mamma attached to the stratocumulus clouds can be composed of ice particles, although they can be a combination of ice and water or just water. The mamma structure pouches or sacs are derived from the Latin word for udders and it is clear why when you see their structure. They hang or drop from other cloud structures and form a kind of sac beneath them. How common are stratocumulus mamma clouds? Stratocumulus mamma clouds can be found just about anywhere, although they are not as common as many other types of cloud formations. Where can I see stratocumulus mamma clouds? You can find these types of clouds anywhere in the world, although to be fair you will probably see other types of clouds first. 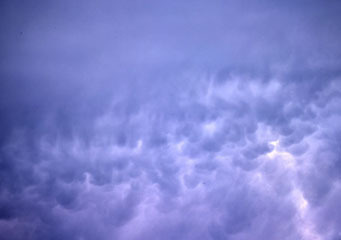 They can be quite striking and dramatic and often can be seen attached to clouds following a storm or heralding a storm.